We’re on the 4th day! Today, we are giving away 1 pair of adorable Daisy Roots soft sole shoes to a lucky winner. Generously sponsored by Just For Tots, Daisy Roots are the safest shoes for your baby’s feet. Handmade in Northampton-England, Daisy Roots footwear are manufactured using environmentally friendly, chrome free leather. Chrome, like other chemicals, can be absorbed into skin through direct contact or ingested by babies when sucking the shoes. my sweetie pie wld like to hv her 1st lavender shoe with butterfuly (12-18mos). It will definetly look sweet & fashionable on her little feet. Can my baby Ashley have a pair of White Shoe with Pink Leaves (6-12m)? I wish my girl will be someone who loves the nature and animals, hopping she is able to learn about them through sight and sound around her and even the clothing that she is wearing. I am still a daddy-in-progress who is learning with her at the same time. I'm a 15 months old (mumma's cutie pie) girl. 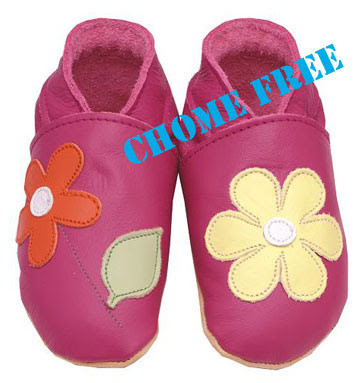 I would like to have a pair of White Shoe with Pink Leaves (Size 12-18 Mths). This is absolutely adorable as it's as natural a shoe as possible. What best I can get which even compliements my organic clothing? I love the things which are natural. Would like to hv a pair of white shoe with pink leaves (12-18mos). my little Keith would like to have a pair of RUGBY shoe (6-12mths) for his 1st X'mas present!!! He will definitely be happy to have this pair of shoe that will be able to show off to everybody how nice the shoe matches him. Yesh!! !